Meaningful Volunteer is live and we are most excited! We are sooo keen to shake up the volunteer world and make a real and meaningful impact on developing communities. To celebrate the event Meaningful Volunteer held a launch party at the Curry Town restaurant in Itaewon, South Korea. 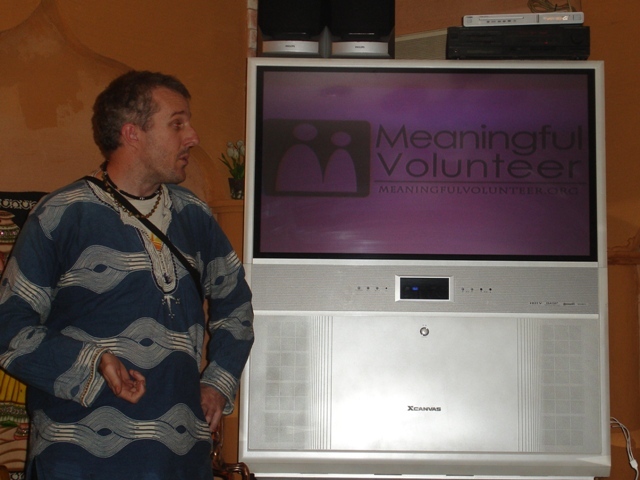 Malcolm Trevena gave a presentation on Meaningful Volunteer's vision. The slides from his presentation can be found here. Many people attended the event in person , and many people sent their best wishes from afar. It was great to have people from so many different cultures present. Ugandans, Ghanians, Indians, Thais, Koreans and countless more from other cultures. How much would I love to come to Korea for this launch???? A lot. Sadly it's not in the cards though. Best of luck Malcolm, I hope it's a smashing success, I'm rooting for you the whole way bud!! Great work Malcolm! My heart and thoughts will be with you for this fabulous event:)To everyone attending the "Go Live" event, I am proud to be sharing this world with all of you! Malcolm is truly a reflection of all the inspiration he has seen in this world. May we all experience life each day and be inspired like him! Congratulations, good luck, and peace to all! Hey Malc, hope all goes well with the evening. All the best with the launch! It looks like a fantastic idea. I wish you all the best with it and look forward to seeing your results! This is a great initiative. So many developing countries are littered with garbage. Not only does this encourage community cleanup, but it also empowers kids that would otherwise lose out on their education. I love it and wish you all the best in obtaining adequate funding. Let me know when you plan to bring the programme to Uganda. I'm here and willing to assist you, especially if you're willing to bring it up north where the kids have been totally disenfranchised of the education during the conflict.